Dr. Brett Felton is a Missoula native and enjoys everything that western Montana has to offer, but particularly enjoys mountain biking, hiking, hunting, and fishing. In the community he is a member of Sunrise Rotary, a board member of Missoula Greenhorns, and has been involved with several local charities including: Missoula Youth Homes, Watson Children’s Shelter, and Ronald McDonald House. Dr. Brett Felton graduated from Hellgate High School, completed his undergraduate degree at the University of Gonzaga in Exercise Science, and received his dental training at Oregon Health and Science University Dental School in Portland. 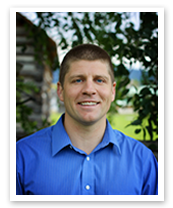 In 2007, cosmetic dentist Dr. Brett Felton joined the practice when he moved back to Missoula. Since joining the practice, he has taken a range of dental continuing education including Invisalign™, dental implant treatment courses, and has studied at the prestigious Kois Center for dental excellence in Seattle. Dr. Brett Felton is a member of Crown Council and several other dental organizations. Dr. Felton is married to Andrea, a special education teacher at Sentinel High School. They are lucky to have two beautiful (and energetic) children, Owen and Clara. Many people have had unpleasant dental experiences. The philosophy in our office is to treat the whole patient, not just the teeth in their mouth. We understand that no two patients are the same, which is why we take time to get to know the individual concerns of our patients. Our goal is to help put an end to the negative feelings that many people have when they visit their Missoula dentist. We achieve this by first of all listening to our patient’s individual concerns at their initial general dentistry exam. This allows us to make sure that we are addressing what is most important to each patient and take time to answer all questions before we start treatment. During treatment we assure our patients that they are in control of their appointment, and utilizing technology that helps make Missoula dentist appointments as comfortable as possible. Lasers, noise-cancelling head phones, and nitrous oxide are just a few options that have helped several of our patients feel at ease during their dental appointments. In the end, the best part of our day is helping patients achieve the healthy smile that they want, while making them feel comfortable during their Missoula dentist visits with Dr. Brett Felton. Part of what makes Missoula such a wonderful place to live is the community and all of the resources that help so many in need. In our Missoula dentist office, we believe that it is very important to not only be part of the community, but actively participate in it.